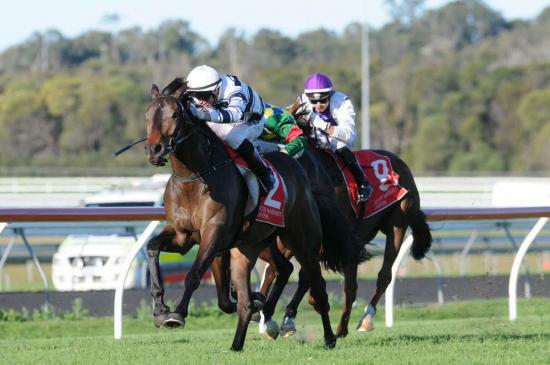 In his third start for trainer Steve O'dea, Butcher Blue carved up an exciting win on Sunday when coming from last to first in the Stripe Pro Signs Class 2 Handicap (1400m) at the Sunshine Coast Turf Club. Named after the Lavin Park Racing colours of navy blue and white butcher hoops, the five year old gelding by Red Element started as the $2.80 favourite. Jumping well from barrier 8, jockey Paul Hammersley rode to instructions perfectly, dropping Butcher Blue to the rear of the field so he could settle in the running. Circling the field on the outside, Hammersley timed the run brilliantly as Butcher Blue flew home strongly to score by a long nose over second place getter Martial Art (Excellent Art). O'dea will now look to step him up to a mile for his next run.